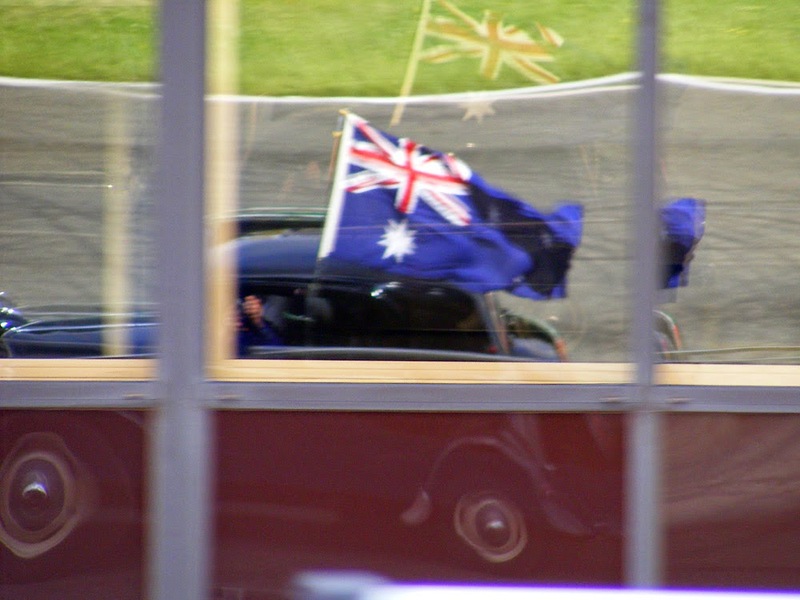 Australia Day is 26 January so we are having a week of Australian themed posts, not just restricting them to Sundays. 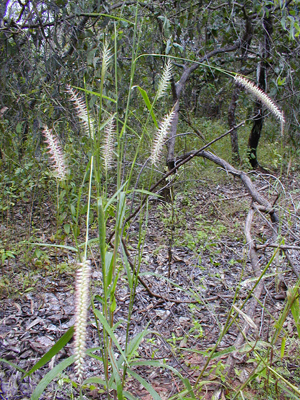 Spear Grass Sorghum ingrans is a very common grass in the woodland savanna of northern Australia. It isn't very palatable for cattle once it matures, but they will eat it when young and its presence apparently indicates good grazing land. 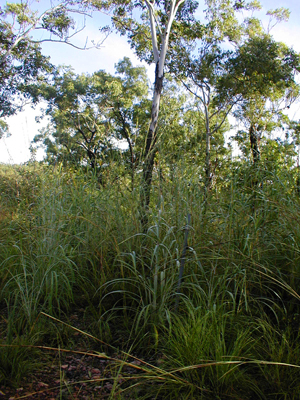 It grows up to 3 metres high and dominates in areas of medium and high rainfall. Check for Ticks! In the middle of winter! I ran into Éric M at the market yesterday morning. He had a tick in a jar that he had pulled off his foot earlier in the day. A la cuisine hier: I dyed my fingers purple by shredding a 2kg red cabbage and 1kg of onions. Combined with brown sugar, red wine vinegar and a secret seasoning blend it all went into my most humungeous casserole, dotted with a little butter and put on to braise for two hours. I whipped up some hummus for lunch since I had half a can of chickpeas that needed using up. We had hummus with lettuce and cucumber in Turkish flatbread wraps. And for those of you anxious to learn what I did with the brined lamb -- I slow roasted it with onions and potatoes, à la boulangère. It was delicious, tender and savoury. I served it with the braised red cabbage, carrots and green beans. 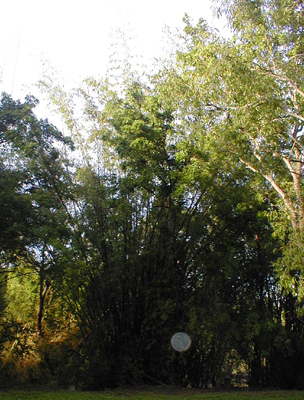 This is Bambusa arnhemica, otherwise known as Top End Bamboo. It's native to the northern, tropical third of the Northern Territory of Australia (an area often referred to by the locals as the Top End), it's big (8 metres tall), long lived and it grows so fast you can just about see it happening. I remember getting the feeling the locals were a bit scared of it. It's usually found on sloping forested river banks prone to flooding but with deep well drained alluvial soil. Because its requirements are rather particular, its distribution is patchy. It doesn't do well on poorly drained soil or where fires are frequent. Where it does grow, it dominates the area. Driving through the monsoon towards Darwin on 1 May 2006. The monsoon season is known as The Wet in Australia and affects the tropical northern quarter of the country, usually lasting from December to March. This pretty grass is a mixed blessing in Australia. 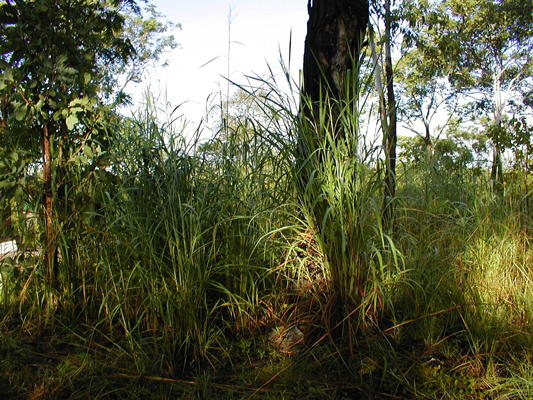 It is Buffel-grass Cenchrus ciliaris, an important pasture grass for beef cattle in the north, but it is an introduced species. It has naturalised and in places is invasive, extirpating the native species by taking their water. It also burns easily and ferociously, something Australia could mostly do without. A la cuisine hier: Beef, Tomato and Pasta soup, which is kind of like liquid bolognaise sauce. Boudin blanc (white sausage) with mashed potato, carrots and green beans, followed by apple crumble. No custard because we've run out of eggs. 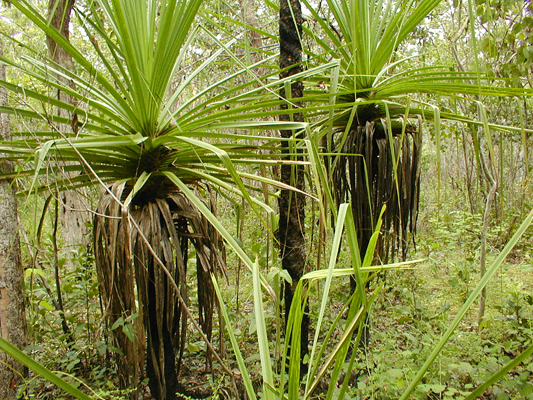 Screw Palm Pandanus spiralis is native to the coastal regions of northern Australia. 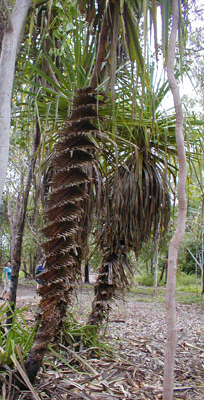 They grow to about 10 metres high, with spiny leaves mounting in a spiral up the tree. Aboriginal people use the leaves to make fibre for weaving dilly bags, string, mats and fish traps. Château à vendre: As we drove past the other day I remarked to Simon what a lovely chateau the one at Verneuil sur Indre is. It has been vacant and for sale since the horticultural college for disadvantaged youngsters moved out. 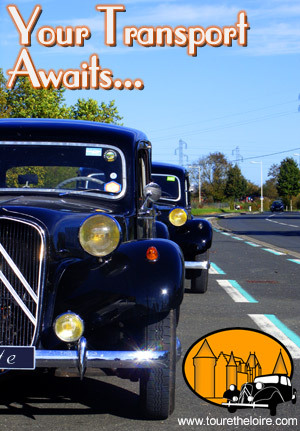 Here is the real estate listing on Terres et Demeures de France if you are interested. A la cuisine hier: Fried rice for lunch. The very last apple from our 2015 crop has been eaten. The billion trillion apples are no more (well, except for the remaining stewed stock in the freezer). Dinner was from the freezer -- beef stew, mashed potato and peas, followed by stewed apple which I made into crumble by topping from a big batch of crumble mix I had made earlier and kept in a jar in the fridge. Finally, I made half a pint of custard from scratch. Célestine reflected high up in the press box windows overlooking the Bugatti circuit at Le Mans. Photo taken in August 2014. 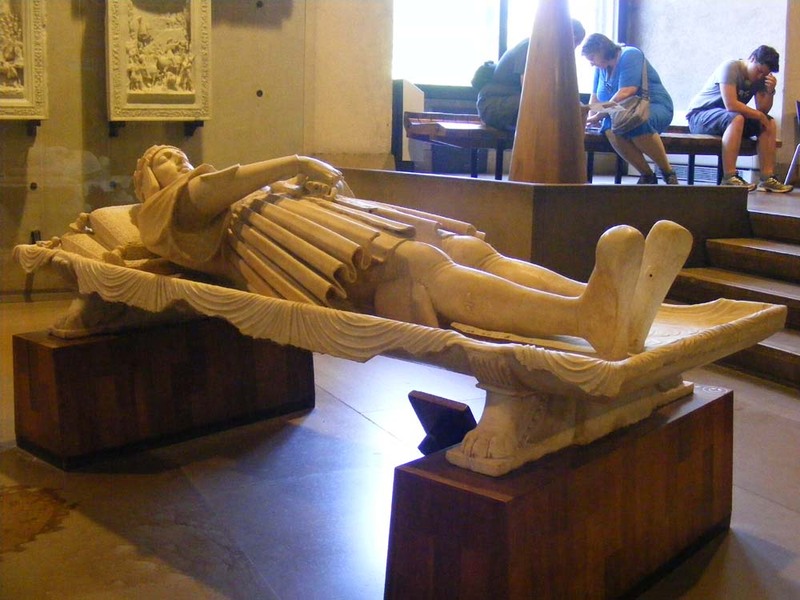 Gaston de Foix, Duc de Nemours, was only 22 when he was killed at the Battle of Ravenna. His military career was short but by all accounts brilliant. By early 1512 he controlled northern Italy, on behalf of his uncle Louis XII, who had fallen out with the Pope Julius II and the Holy Roman Emperor Maximilian I and was engaged in staking his claim to Milan and the surrounding area on the basis of his Visconti grandmother. The exquisite detail achieved by Bambaia and his sensitive modelling of the handsome young man was universally admired. The death of de Foix was a great blow to French ambitions in the area. He was young, energetic, hot-headed and brave and had been shot and killed leading a cavalry charge against the Spanish infantry. Both his contemporaries and modern historians hint that the final outcome of the Italian Wars could have been very different had he lived. Gaining the nickname le la Foudre d'Italie ('the Thunderbolt of Italy') Gaston showed a talent for manoeuvering and strategy that many compare with Napoleon. He specialised in rapid cross country marches and audacious offensive actions. His body was placed in the Duomo in Milan, surrounded by captured weapons and pennants, but after the French left the city his remains were moved to another church, now demolished. In 1515 when François I retook Milan he ordered a funerary monument fit for such a warrior, but once the city reverted to the Sforza's the work was abandoned. Today most of the completed elements are displayed in the Castello Sforzesco. 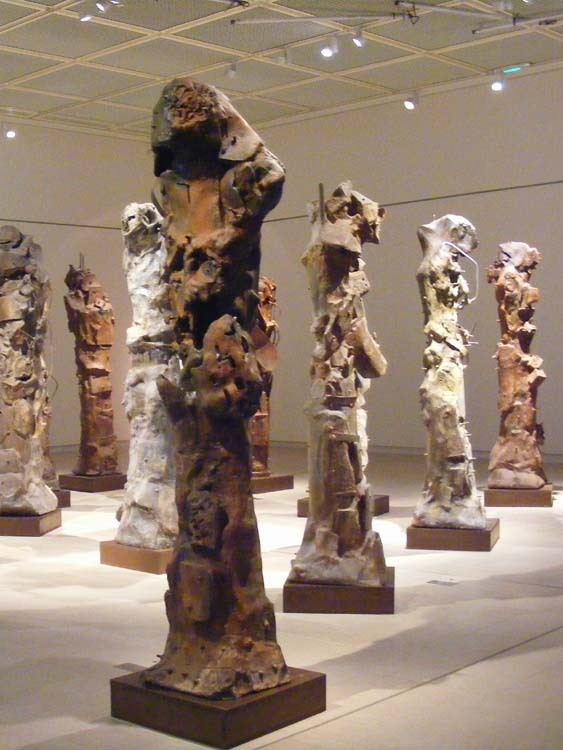 The sculptor is Agostino Busti, known as Bambaia and the work is considered to be his masterpiece. 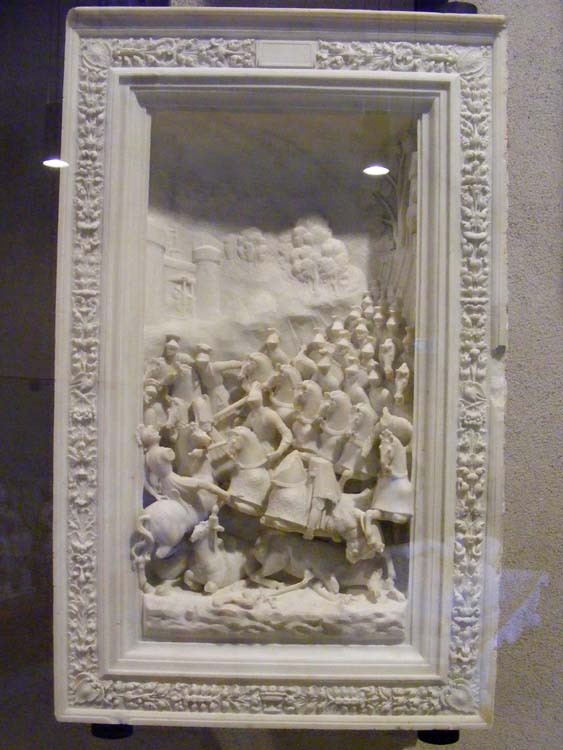 Two of the panels showing de Foix's military engagements intended for the base of the tomb, carved in a mixture of high and low relief typical of late medieval Milanese work. 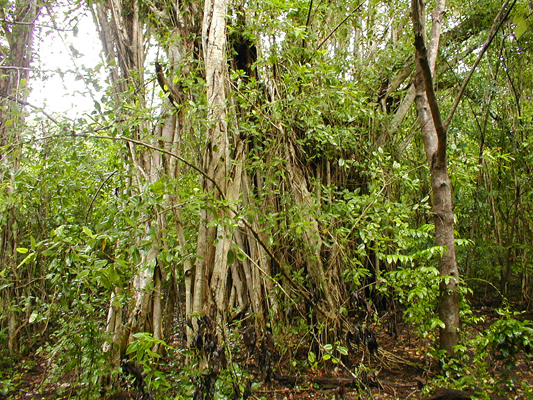 Strangler figs start life as seeds dropped by birds in the crooks of branches of other trees in the rainforest. The fig seed germinates and sends its roots downward to the soil. In the process, over time, its roots envelope the support tree like a cage. Often the fig will outlive the support tree and end up as a living self-supporting scaffolding frame. This one was photographed in the Northern Territory, Australia. Brigitte Terziev was born in 1943, into an artistic and creative family. Her father was a sculptor who emigrated from Romania to France, her mother a television producer and her brother a comedian. 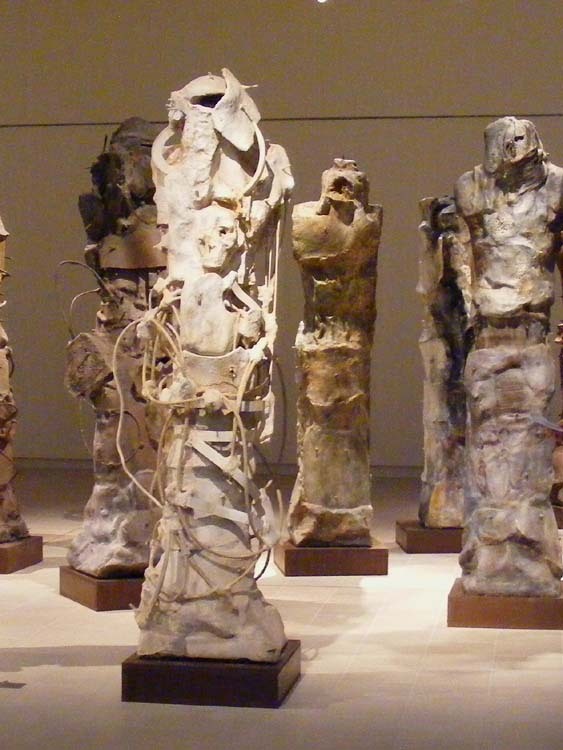 Her series of imposing 'Elders' are constructed of ceramics and metal. The thirteen forms keeping silent vigil in the temporary exhibition space of the Musée de l'Hospice Saint-Roch in Issoudun are the result of years of experimentation with wood carving, welding metal and modelling clay. 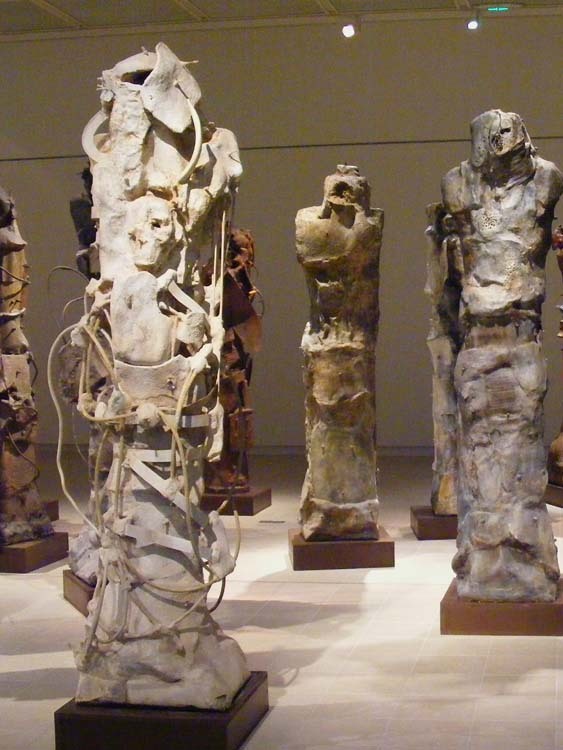 They are eerily human, several metres tall and displayed so that the visitor can walk around and amongst them. You get glimpses of an ancestral past -- shapes that recall classical Greek sculpture, and yet others which have a sci-fi futuristic look. They give the impression of being engaged in some mysterious, silent ceremony, oblivious to the viewer, yet able to radiate a power that induces an uneasy respect, not just for their size and the technical ability of the artist, but for the ambiance the objects themselves create as a group. A la cuisine hier: French Apple Pie, a dish that, as you will no doubt have guessed, is unknown to French people. Until now at any rate. I will be introducing a group of French bat surveyors to this pie at lunch today, as my contribution to the meal after our annual winter bat survey. Dinner was leftover roast rear end of turkey with gravy, potatoes, carrots and chard from our local organic market garden and orchard. I made some sablés with the leftover pastry from the pie and took a small baked custard with plum syrup out of the freezer. In 1524, at the age of 40, Philibert Babou became Treasurer to King François I, and for the next twenty years faithfully served his King in any way he could. A particular talent of his was as a skilled code-breaker, a major reason the King valued him so highly. One of his jobs was to decypher messages between foreign powers which had been intercepted. He gained a reputation for being doggedly persistent, not resting until he had cracked a code. The Babou family tomb monument, Eglise St Denis, Amboise. Prior to his appointment as Treasurer, he had been mayor of Tours and was the owner of a very grand hôtel particulier in the city (now known as the Hôtel de Jean Galland and the current headquarters of the Touraine Archaeological Society). In 1510 he married into the prominent Gaudin family, owners of the Chateau of Bourdaisière at Montlouis sur Loire. The bride, Marie, was probably 15 when they married, Philibert eleven years older. Together they produced eight children (five boys and three girls). From the beginning the couple were close to the King, and the powerful de Medici family in Florence (one of whom was Pope Leo X, the second son of Lorenzo the Magnificent). Their third son, also Philibert, was born in Italy in 1513 and spent most of his adult life in Rome, in the service of Henri II and his sons, as ambassador and cryptographer. 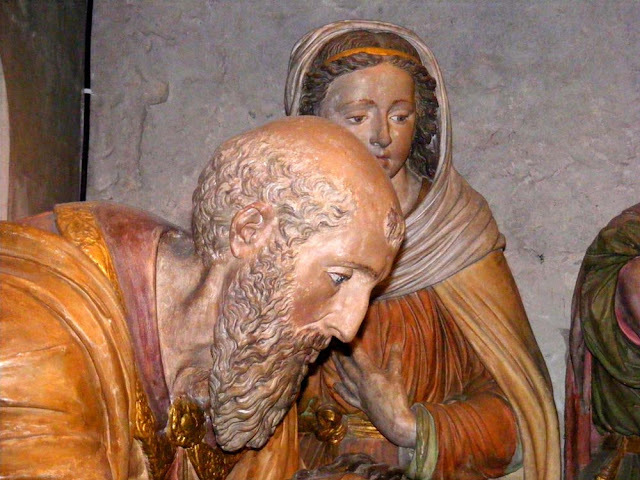 Nicodemus (on the right) and Mary of Clopas (on the left). 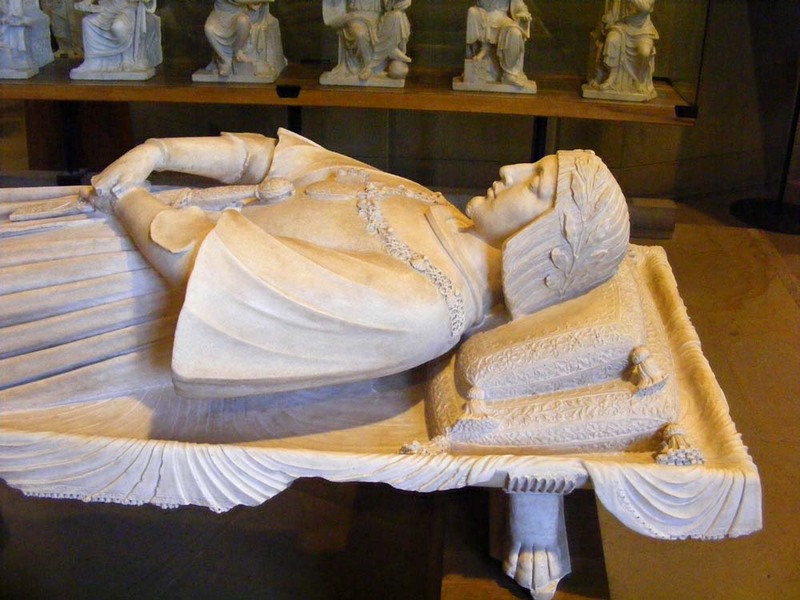 Marie was considered the most beautiful woman of her time and in 1520 François I began an affair with her. At around this time either he or Philibert commissioned the rebuilding of the chateau at la Bourdaisière, to create a fashionable modern residence for the lovely Marie. However, François did not, as far as I can tell, name Marie at any stage as his official mistress (who in 1520 would have been Françoise de Foix). On his retirement in 1544 Philibert endowed a chapel at the priory on his property the Chateau of Bondésir in Montlouis sur Loire. This chapel has now disappeared, but the funerary vault dug into the hillside underneath it still exists. 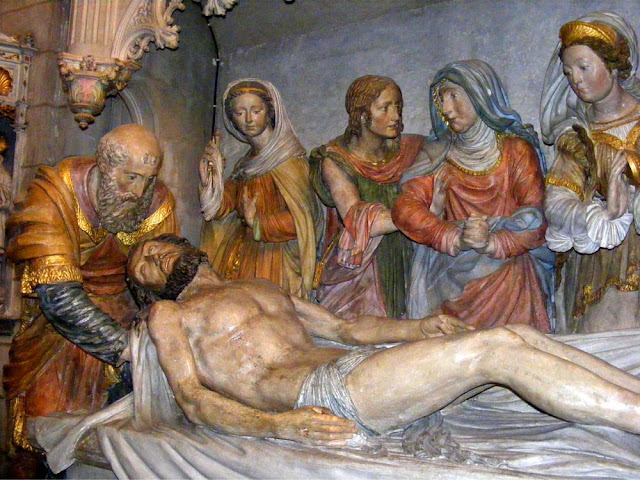 Probably at the same time as the chapel and vault was commissioned he also commissioned a sculptural group of eight life sized figures in painted limestone depicting Christ's body being placed in the tomb (Fr. une mise au tombeau). Joseph of Arimathea, with Ste Veronica in the background. 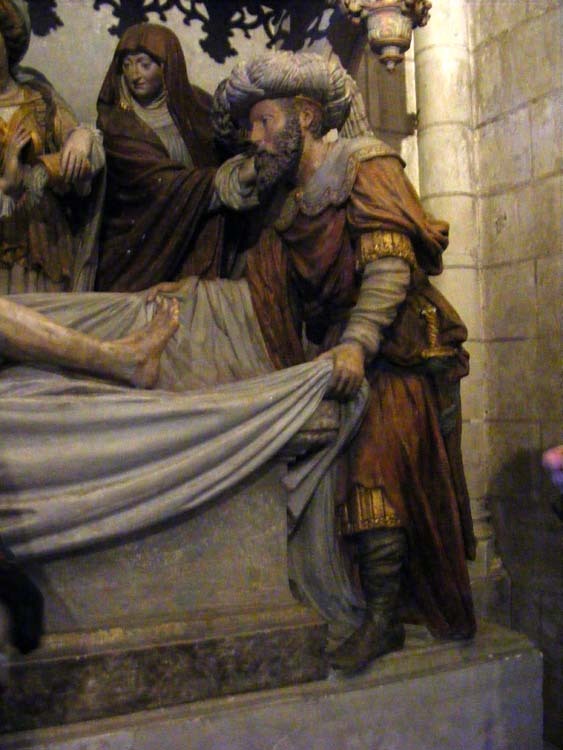 Tradition has it that the figures in the mise au tombeau are modelled on members of the Babou family. In particular, the figure of the Virgin Mary is thought to be based on Marie Gaudin, who would have been about 50 at the time the work was created. The other figures are Christ, Joseph of Arimathea (supporting Christ's head), Nicodemus (at Christ's feet), three female saints (Veronica holding the veil with which Christ wiped his face, Mary Magdalene pouring aromatic oils from a flask, Mary of Clopas holding the crown of thorns), and Saint John the Evangelist supporting the Virgin Mary. 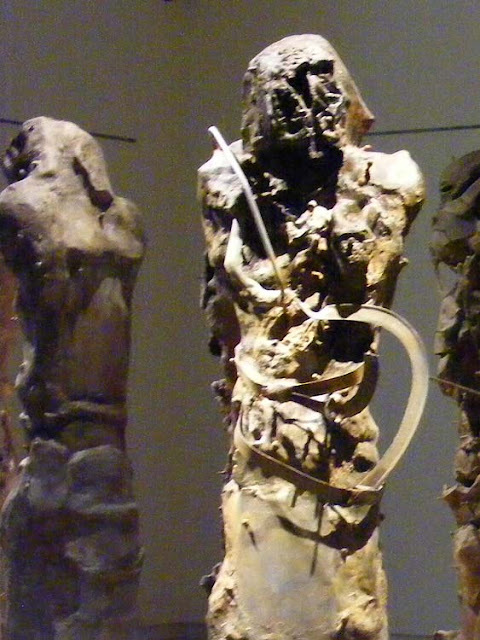 The female saints are widely believed to be the three Babou daughters, but there is considerable variation in the accounts of who the male characters are based on. Philibert is nominated as Joseph, Christ or Nicodemus depending on who you read. Christ might be based on François I, Nicodemus might be one of the Babou sons, as it is supposed Saint John is. Mary, the mother of Christ. Is this the face of a 50 year old Marie Gaudin? 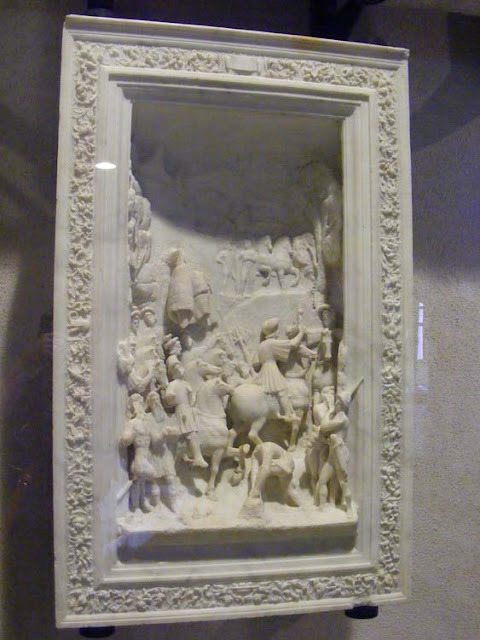 The sculpture may date from around the time of François I's death in 1547, and this has lead to some speculation that Christ is François, while Philibert is either Joseph or Nicodemus. One theory is that it was Philibert's subtle and clever way of gloating that his love rival was dead, even while making him the appropriately highest status character in the tableau. Delivering personal opinions by way of intricate coded visual cues was a regularly employed technique, but in this case it could just as easily have been a more straightforward message of honouring a powerful patron. In any event, whoever Christ is modelled on, it is certainly quite likely that the other figures are indeed modelled on the Babou family, and it would have been a fashionable approach to this sort of monument. Mary of Clopas holds the crown of thorns on the left, Nicodemus on the right. The characters wear rich and generous draperies in a somewhat orientalist style fashionable for the 16th century, the better to convey to the 16th century viewer a sense of the status of each character. Headgear is particularly important for identifying characters and sorting out status. Nicodemus is wearing a large and quite ornate turban of patterned cloth. 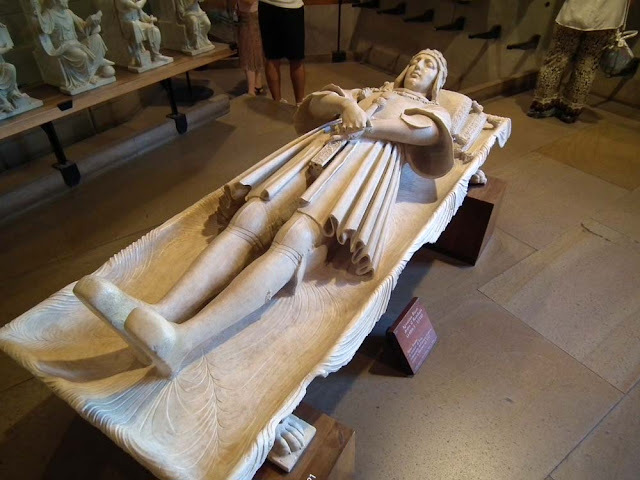 It is this aspect of his attire more than anything which would suggest that Philibert senior is the model for him, even though Joseph of Arimathea, as the owner of the tomb, is seemingly a more obvious candidate. On the other hand, both Nicodemus and Joseph are armed and their robes gilt trimmed (ie high status). Perhaps Joseph's bare headed portrayal is to indicate a good man humbly carrying out God's work, just as Philibert may have wished to represent himself. Amongst the women, the redeemed sybarite, Mary Magdalene, is clearly the prettiest and wearing the richest garb. Her headdress, which I at first took for a crown and was puzzled by, is gilded. I think the message might be that anyone can come to God and it need not interfere with you looking gorgeous or showing off your assets. Displaying wealth and conspicuous consumption was seen as a positive thing in this period, even a duty if you were wealthy. The 16th century viewer may have read these signals a little more easily than us, but they were always complex and multi-level in the messages they carried, and the deeper one looked the more one had to puzzle it out, even when they were first presented. It was in part a test of how educated and sophisticated you were. From left to right: Joseph of Arimathea, Ste Veronica, St John the Evangelist, the Virgin Mary, Ste Mary Magdelene. In 1770 the priory attached to the chapel was not earning enough revenue to cover expenses. The then owner of Bondésir, the Duke of Choiseul (who also owned la Bourdaisière, the Chateau of Amboise and the Chateau of Chanteloup) applied to the Archbishop of Tours to close the priory down. His request was granted and the Babou funerary monuments in the crypt were moved to the church of Saint Florentin in Amboise. 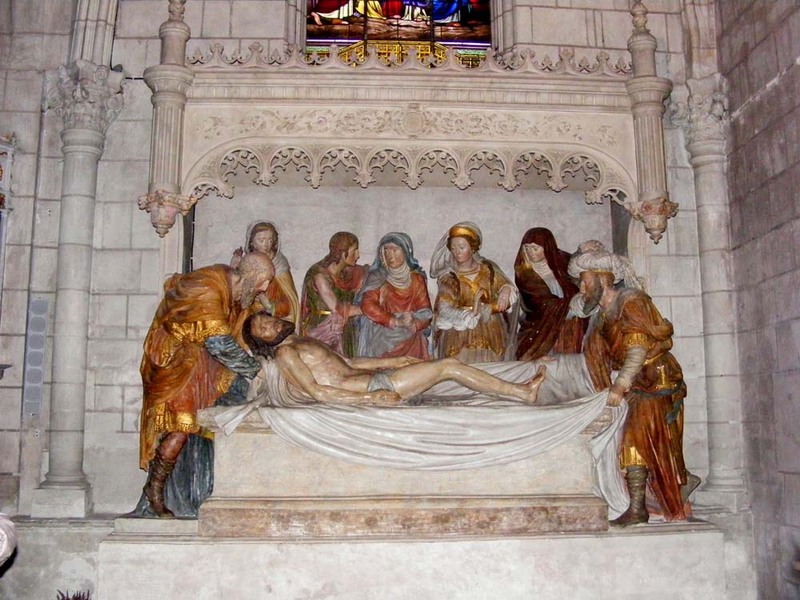 In 1863 the mise au tombeau was moved again, this time to the church of Saint Denis in Amboise, which was undergoing a major restoration. 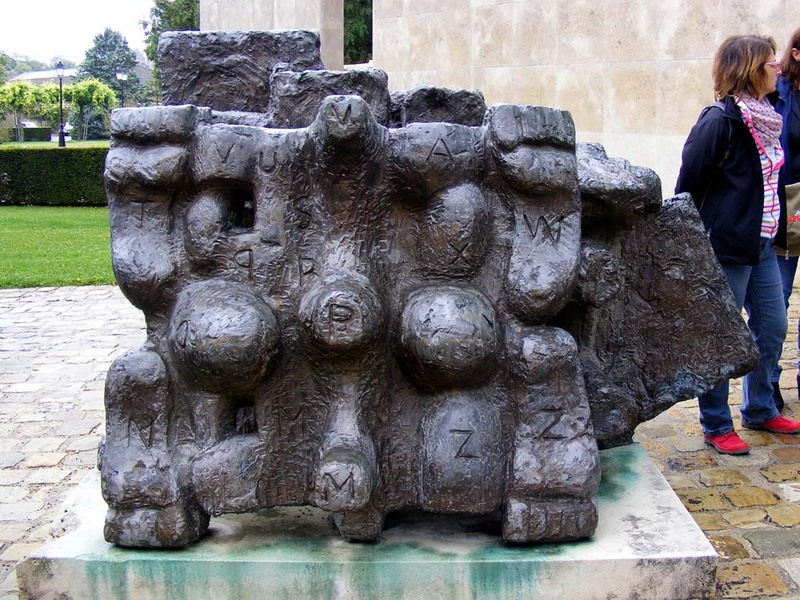 The mise au tombeau was restored as part of this project, but in 1975 the way the sculpture was presented was altered and it was restored again more sensitively. The conservator removed internal rusting metal dowels and plaster repairs, stripped the 19th century paintwork to get down to the original paint and render. 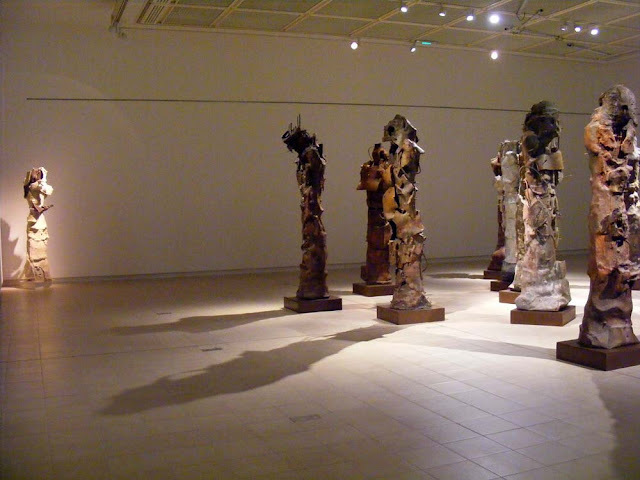 The figures were placed on a new, lower podium and sections of plinth and background re-rendered as necessary. The new arrangement and accessiblity caused some comment, with fears being expressed about the number of people who would touch the sculpture, either innocently to ascertain the material, or maliciously to graffiti. This mise au tombeau bears a close resemblance to a similar monument now in Notre Dame la Grande in Poitiers. This group of figures dates from 1555 and was commissioned by René d'Amboise. 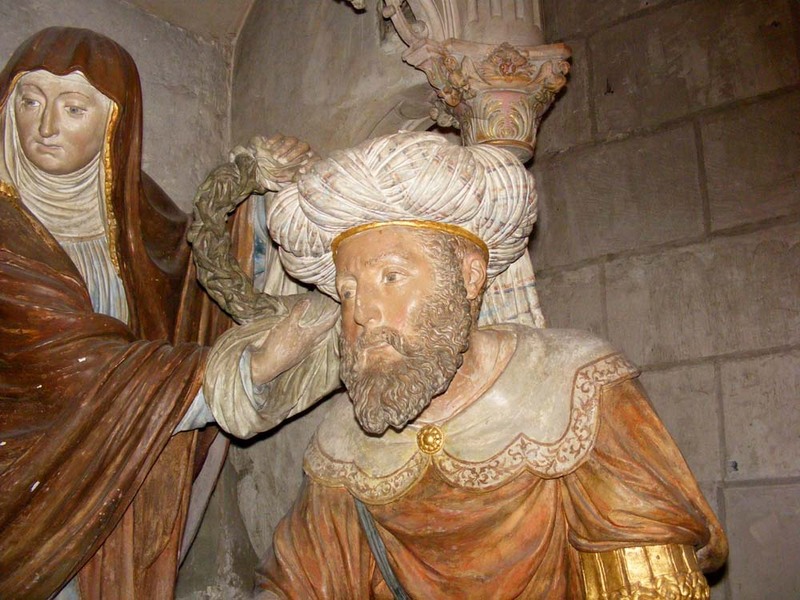 Many thanks to blog reader J-L M, who was baptised in Eglise St Denis, for alerting me to the whereabouts of the Babou monument and sending me some useful archival material on the subject. Rosemary has blogged about the visit we made together with friends to Eglise St Denis here. I've written about another funerary monument connected to the Babou family here. The pilgrim hospice (Fr. Hôtel-Dieu) in Issoudun which today houses a museum, preserves in its collection '6 small pictures of enamelled copper' in the former sacristy. They were listed in 1777 as part of the altar furniture, according to the inventory of the furniture and effects of the hospice of Issoudun taken at the time. They date from the late 16th century. The two most beautiful plaques are monogrammed [L⚜L] as the work of Léonard II Limosin (1550 - 1625). They are a complementary pair and must have been arranged as a diptych mounted on the retable or other liturgical objects. Our Lady of Sorrows, enamelled copper, by Léonard II Limosin, late 16th century. 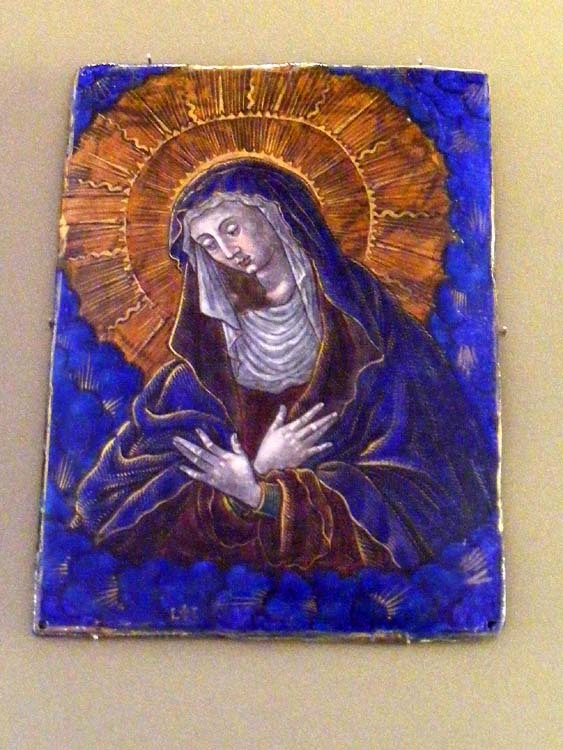 The haloed figures of Christ and the Virgin emerge mid-body from a blue and gold background. Christ holds in his left hand a globe surmounted by a cross, which he blesses with his right hand. He is the Salvator Mundi, triumphant saviour of the world. 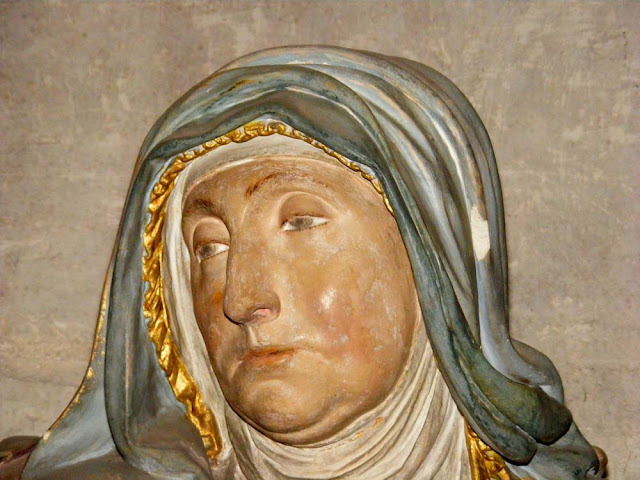 The Virgin inclines her head to the right, crossing her hands on her breast in a sign of her sorrow. This is the Mater Dolorosa, Our Lady of Sorrows. The two hands crossed on her breast are copied from the famous sculpture by Germain Pilon commissioned by Catherine de Medici in 1586. The impression of great pain and sorrow is reinforced by the expression on her face, the fine draughtsmanship and subtle application of colour giving a grace and feeling of profound contemplation. A la cuisine hier: Five Bean Soup, with red lentils, blond lentils, giant Lima beans, black beans, chickpeas. The recipe it's based on is called Sixteen Bean Soup but I didn't have sixteen different sorts of beans in the pantry, and I used broccoli instead of kale because that's what I had on hand. We opened one of the Moretti beers we brought back from Milan for apéro. Maybe a mistake -- bottles bought on holiday in the sun don't have quite the same impact when they are drunk in the depths of winter at home. 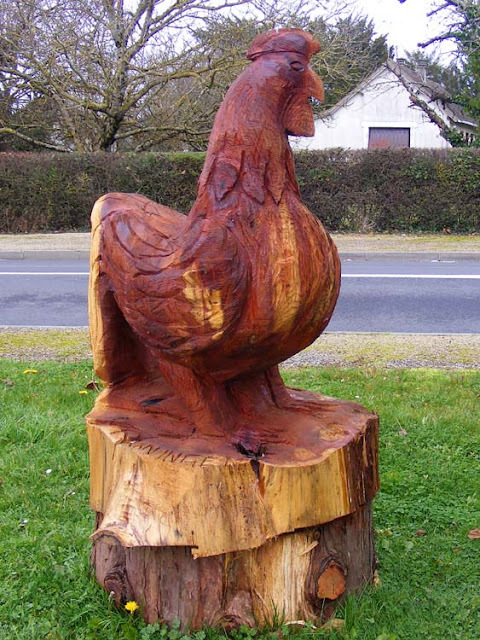 This chainsaw cut sculpture of a rooster has recently appeared in Paulnay, in the Brenne. It stands at the side of the main road through town, near the entrance to the sports field. Having discovered, through his former trade as a forester (Fr. bûcheron), the different qualities of woods, Patrick van Ingen from Prissac developed a real passion for the material. 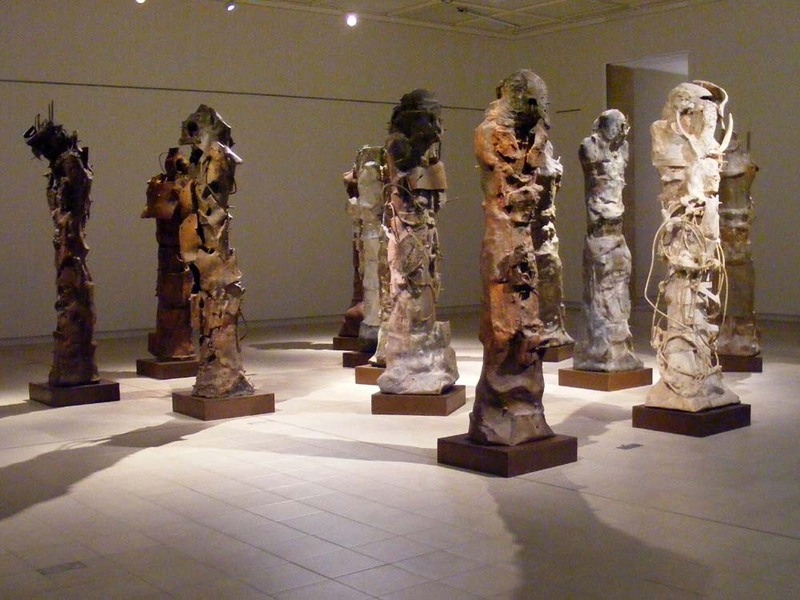 After several years of manual sculpting, he started seven years ago to carve with his chainsaw (Fr. 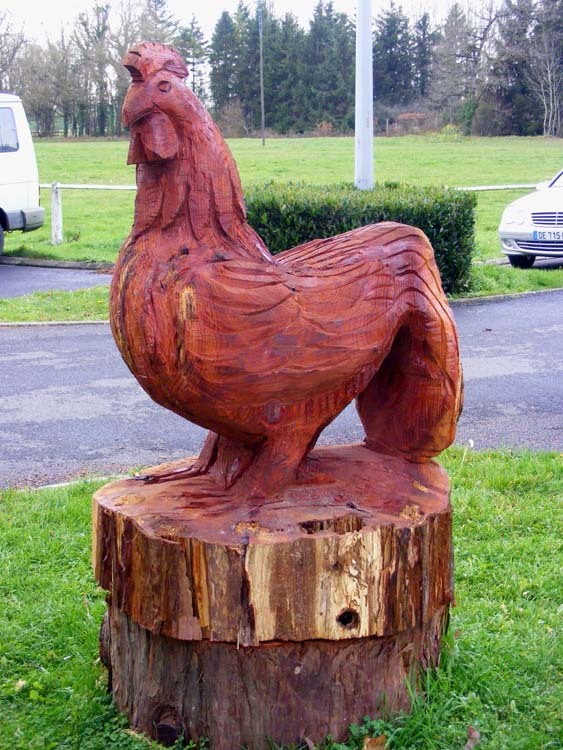 tronçonneuse) and this rooster is a typical example of his work. Henri Etienne-Martin was a French non-figurative sculptor born in 1913. 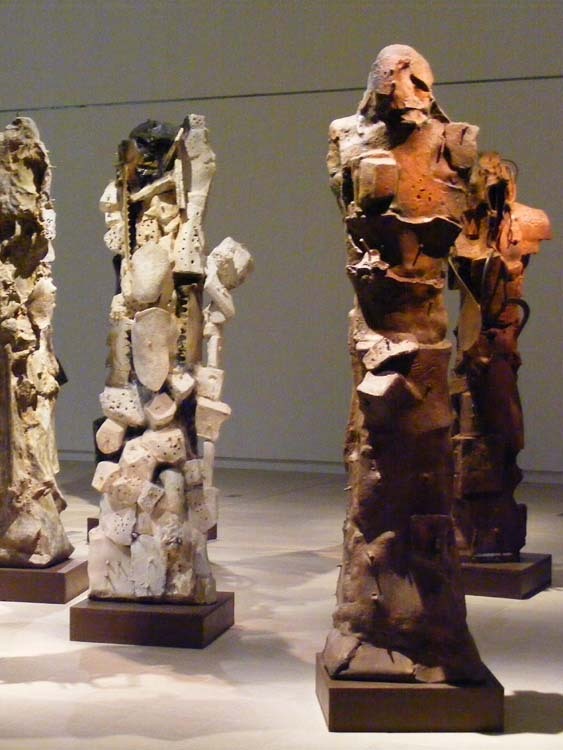 Before the Second World War he worked primarily in wood and plaster. 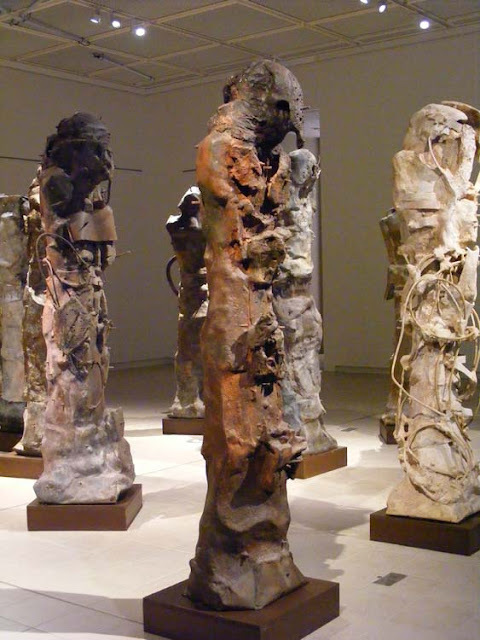 After the War he extended his repertoire to include many more media, ranging from bronze to string. 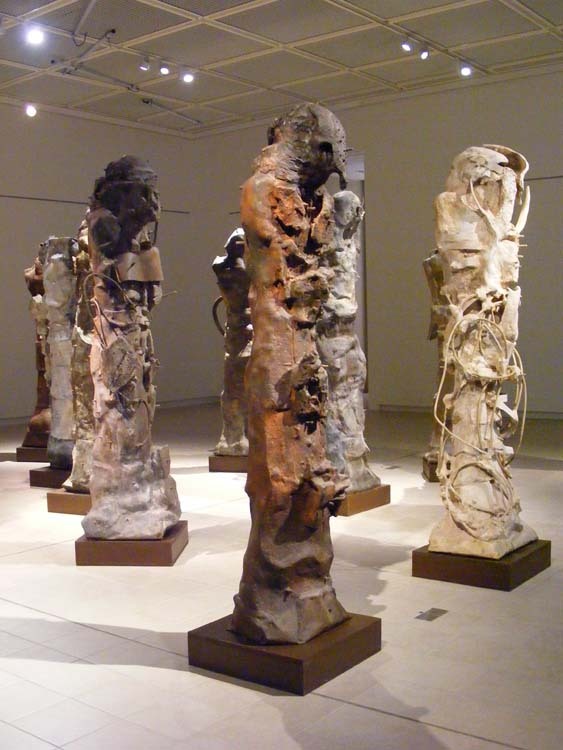 He won the Venice Biennale prize for sculpture in 1966 and from 1968 to 1983 was head of the sculpture department at the Ecole nationale superieure des Beaux-Arts in Paris. He died in 1995. 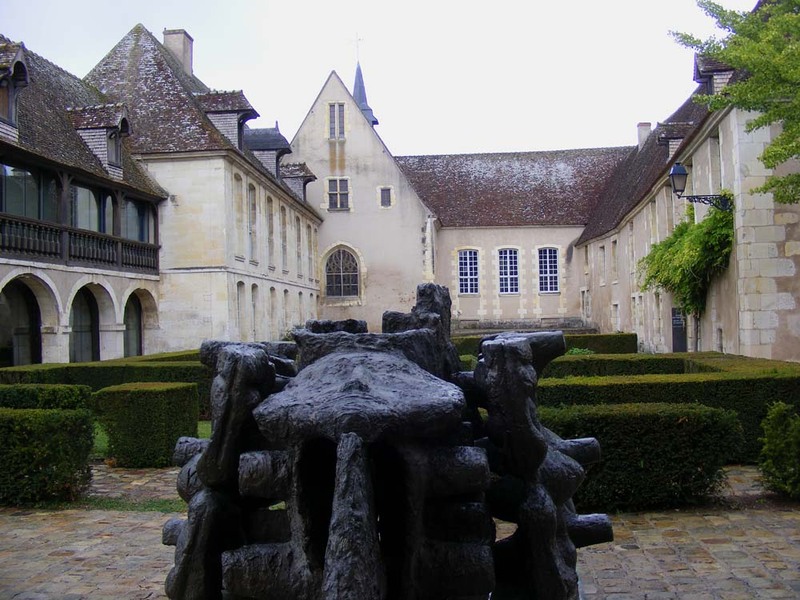 Le Puits-Fontaine, in bronze, is also known as La Maison de l'Est and sits in the courtyard of the Musée de l'Hospice Saint Roch in Issoudun. The work is number 17 of a series taking their inspiration from the house he grew up in and executed over a 30 year period in several media and ranging in size from monumental to small. Le Puits-Fontaine dates from 1981. La Sala delle Asse ('the wainscotted room') is a first floor room with a vaulted ceiling in a corner tower of the Castello Sforzesco. Its name comes from the lower part of the walls having been wainscotted at some stage, a standard technique to protect against the dampness of the stone. The room is currently the subject of a major restoration, as usual much of which is to sort out earlier restorations. The focus of the restoration is the once highly decorative ceiling and upper walls, painted by Leonardo da Vinci. Sadly its current condition is a murky mess. Because Leonardo couldn't paint true frescoes, which requires that the artist finish a small section of paint on wet plaster every day, the room was painted in tempura on dry plaster (like the Last Supper, also in Milan). Leonardo worked and reworked paintings endlessly, so true fresco was a technique he never mastered. As a result the condition of the painting deteriorated relatively quickly. 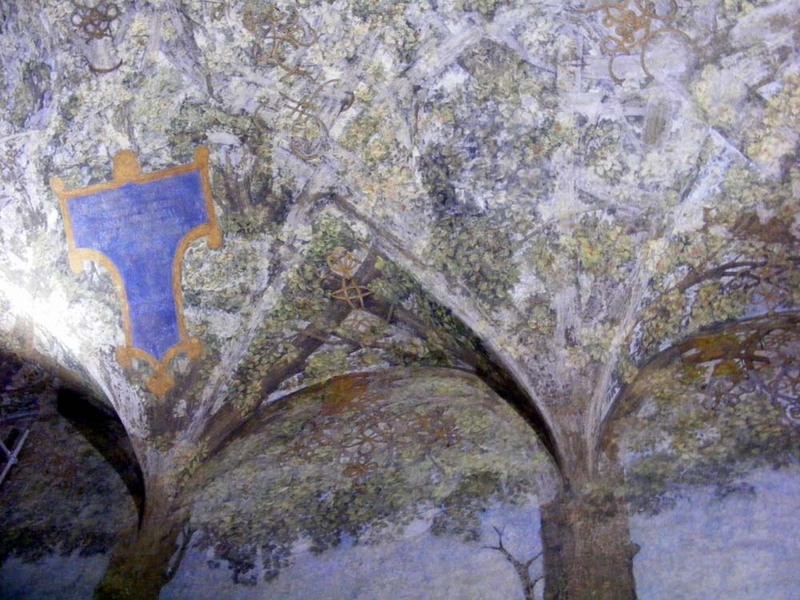 The painted ceiling of la sala delle asse. The subject matter is thirteen mulberry trees rising up the walls and intertwining with a golden cord amongst the 'lunettes' formed by the ceiling vaults. The trees emerge from a rocky monochrome landscape on the walls, once thought to be a later addition, but now realised to be the work of Leonardo too. The idea is obviously to create an illusion of being outdoors and the room would have been used to entertain important visitors. It is one of the earliest examples of this style of bringing the outdoors inside. The choice of mulberries probably refers to Duke Ludovico Sforza, who was known as Il Moro. The nickname means 'the Moor', on account of his dark complexion, but the Italian for mulberry is also 'moro'. The work can be dated to around 1498 because of correspondence at the time of its creation which discusses the decoration of the room and that Leonardo promised to have it finished by September of that year. It's odds on that he didn't, although there is no further surviving correspondence to tell us one way or the other. Some historians suspect it was in typical Leonardo fashion never finished, despite Leonardo probably having at least one assistant for the job. In any event, in 1499, Ludovico fled the city and Louis XII of France took over. (Ludovico was subsequently captured and imprisoned in the chateau of Loches, where he died.) At some point the painting was plastered over. No action on the conservation front. It was August when we visited and all the conservators were on holiday. In the 18th century under the Austrians the Castello was turned into a barracks. The room, which connected to the city of Milan via a bridge over the moat, was used as a stable. 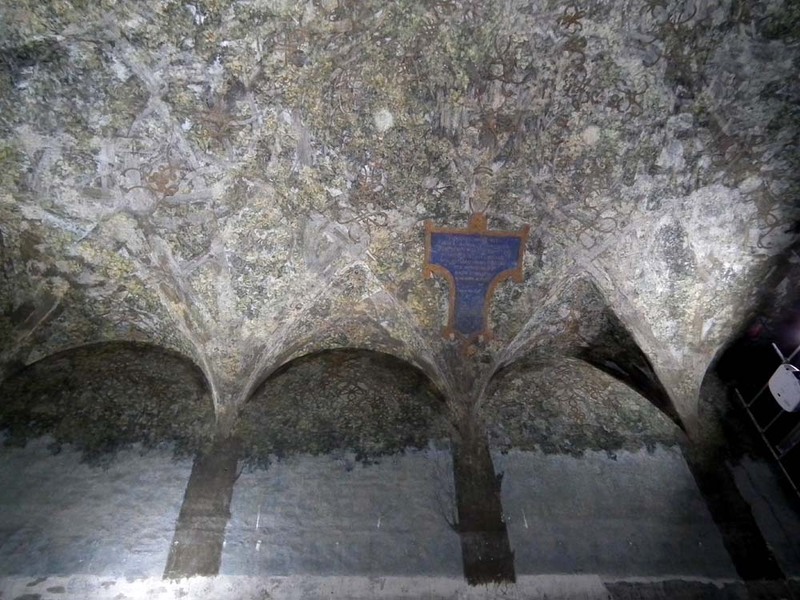 In the late 19th century when the Castello was handed over to the municipality of Milan the curator lifted some flaking plaster and discovered the paintings underneath. In 1901-2 the painting was 'restored' (essentially repainted, with a great many additions to the original design, which results in the busy jumbled image you see today). This particular restoration was done in really garish colours. People hated it and in 1954 it was restored again, primarily to tone the colours down, but also to remove much of the additional 'interpretation' which was not part of the original design. 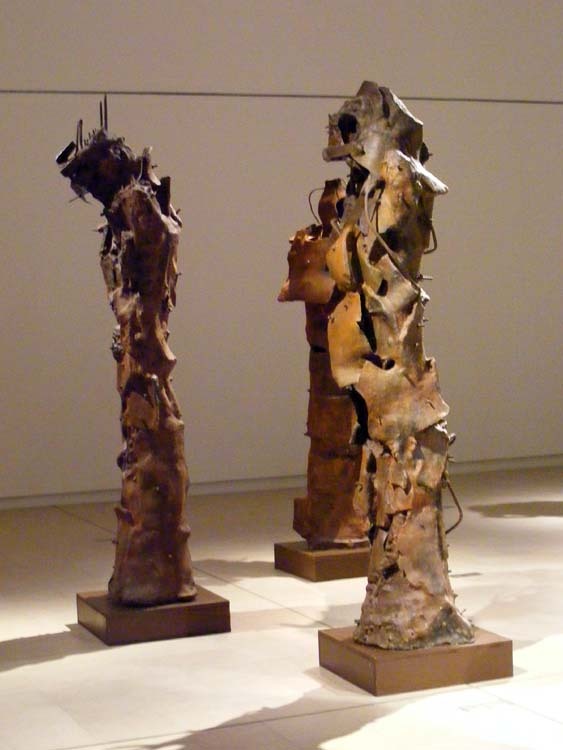 In 2006 an inspection of the paintings was carried out, revealing significant deterioration. The current restoration is dedicated to establishing the causes of the deterioration and rectifying them so the painting will be stable. They are also taking to opportunity to establish exactly what has been done to the painting in the past. Then the paintings will be cleaned to enhance their legibility. A detail showing how the design flows in and out of the lunettes. You can follow the restoration step by step with a series of interviews and short presentations on the Castello's website. 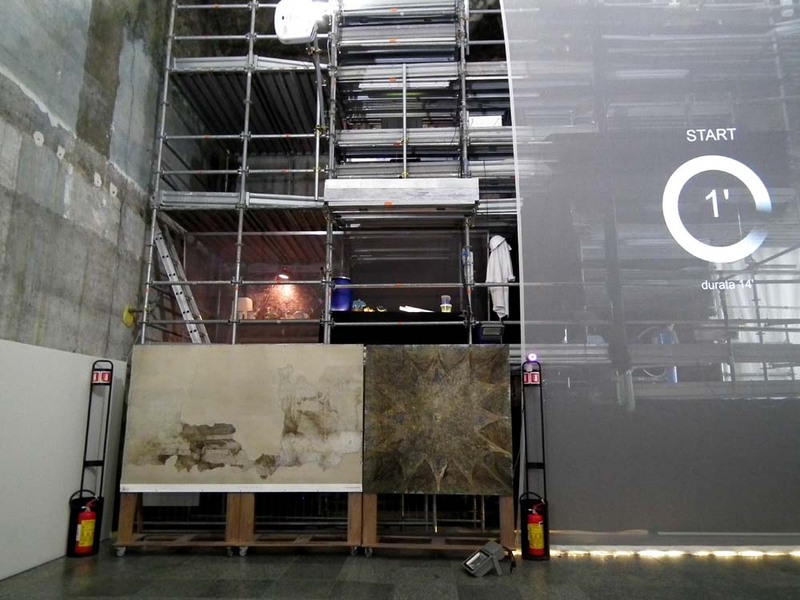 The museum has also uploaded a series of short videos on the technical aspects of the restoration which are very informative if you are interested in the current state of wall paintings conservation. The other day I had a serious tidy up and clear out in the entrance hall. Inevitably it ends up as a dumping ground and all sorts of random stuff turned up, including this koala. 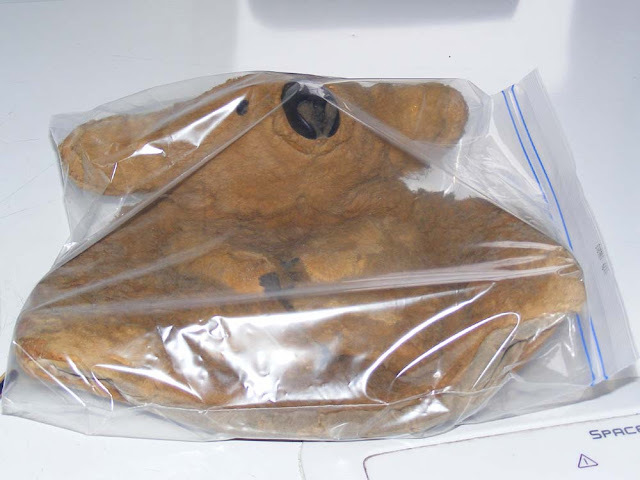 It is made of kangaroo skin and belongs to Simon. It's a tea cosy from the 1960s. Before I allowed it into the house proper I wanted to be sure it was pest free so I checked it over carefully. There were a couple of clothes moth chrysalides and a little patch of fur came off in my hand revealing bare skin. So into a snaplock bag it went and like that into the freezer. Three weeks in the freezer will kill pupae, eggs and adults of any insect busily munching its way through all that nice organic material (ie skin and fur). Almost every Australian who was a child in the 1960s would have had a soft toy koala made of kangaroo skin. Mine was small to medium sized and gray. Its name was Dear Dear and I took it everywhere. I was also apparently horrible to it, regularly doing things like throwing it out of the car window as we drove down our long dusty farm driveway, or dunking it in the toilet. Once separated from Dear Dear I was earsplittingly inconsolable and all other family activities stopped until we were reunited. So I'm told anyway. I was way too young to remember any of this. Dear Dear survived well into the 1970s, but eventually succumbed to the ravages of clothes moth and was disposed of. Loire Valley Nature: A new entry has been added for the beautiful violet coloured mushroom Bruising Webcap Cortinarius purpurascens. Rue de la gare translates as 'Station Street', and as you would expect, Chateauroux railway station is indeed at the end of the street. But that is not the only building of note in the street. Three of the buildings on the right, as you proceed towards the station, are superb examples of the carpenter's art, and all are listed as Historic Monuments. Looking down rue de la gare towards the station. The eastern corner of 12/14 rue de la gare and the corner of rue Ledru Rollin. Moreau was an entrepreneur, in business with his brother-in-law Armand Viraud, who specialised in public works. Together they tendered and worked on all the major public works in Chateauroux in the last decades of the 19th century. Corner of 12/14 rue de la gare and rue Ledru Rollin: This building suffered a fire in 2001 and has been restored subsequently. The ground floor is stone but the first floor is entirely timber-framed (Fr. colombage) with the timbers set in Saint Andrew's crosses. It dates from the second half of the 19th century. The footprint is rectangular, with the east facing corner cut off. It is a house, with a ground floor which is a shop, then the first floor and attic accommodation. 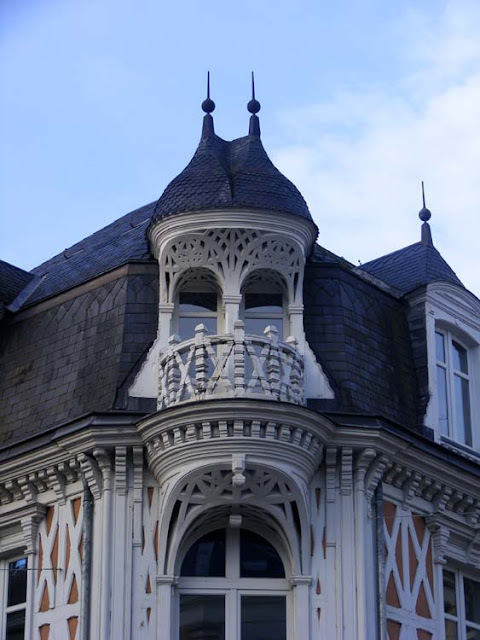 The house is of great architectural interest because of the ornate carpentry of the main roof and the roofs of the first floor French windows (Fr. portes fenêtres). The central French window on the rue de la gare side is paired with a capucine balcony with banded balustrade, a capucine, flanked by capuchin ties brought together by a cantilevered Saint Andrew's cross. 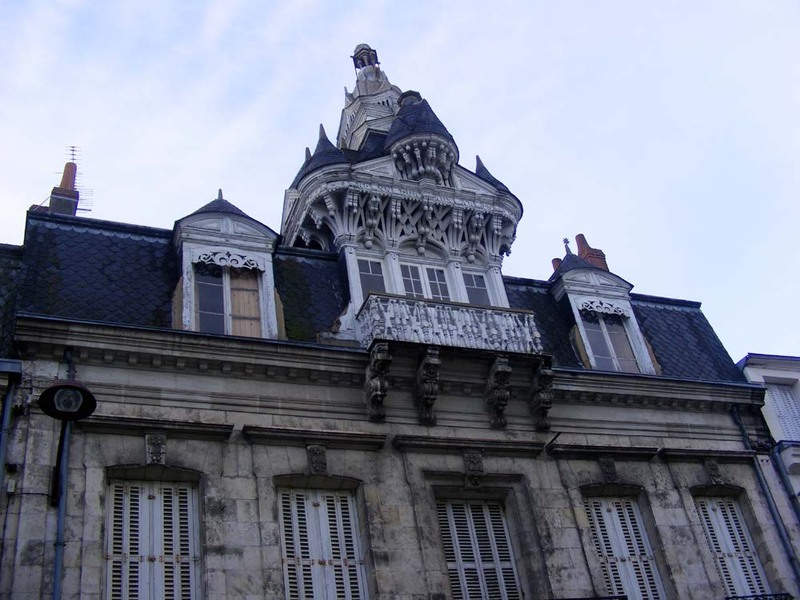 A double capucine lucarne sits above the balcony and under the projecting cornice there are four triangular pediments topped by a polygonal roof. On the cut away eastern corner a double guitarde dormer is supported by a guitarde balcony. The attic includes two domes which meet in a V, fitting on to the straight end of the main attic. 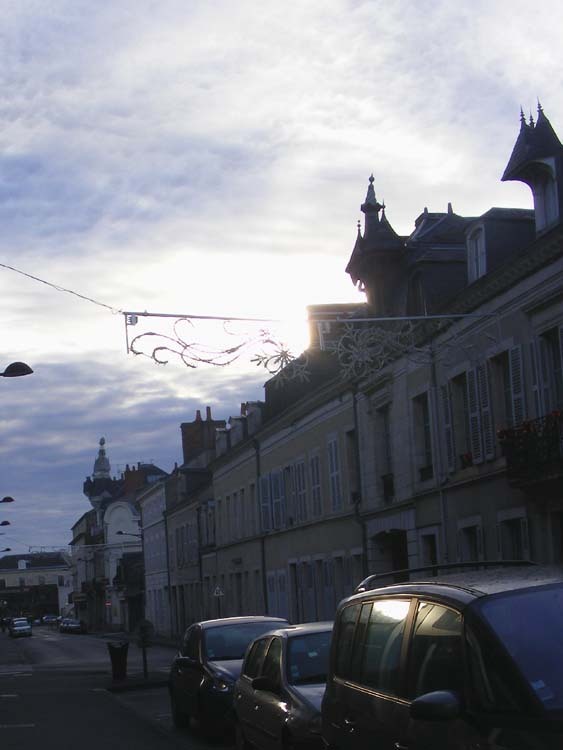 Corner 12/14 rue de la gare and rue Ledru Rollin, Chateauroux. On the rue Ledru Rollin facade you can see a split capucine covered balcony cantilevered above three posts, the centre forming a corner. Five wooden brackets carry the cantilevering in a semi-circle and fall back to a twisted fluted column. 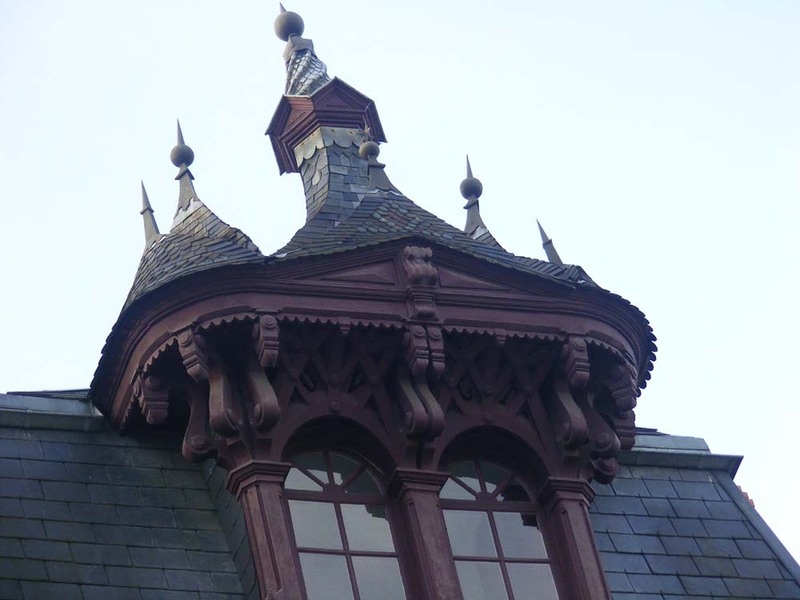 The two capucine roofs are decorated in the Empire style. A relatively simple but nonetheless interesting capucine on 50 -58 rue de la gare. 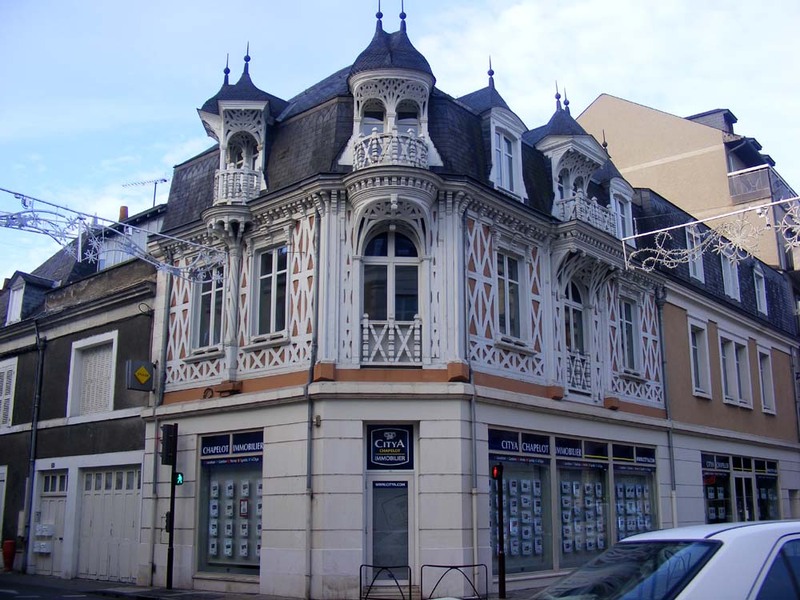 50 - 58 rue de la gare: The building dates from the final quarter of the 19th century. Main lucarne on 50 - 58 rue de la gare. 72 rue de la gare: The main lucarne carries the inscription UVGT, which stands for the symbolic values Union ('union'), Vertu ('virtue'), Géometrie ('geometry') and Travail ('labour') of the Compagnonnage du Devoir (trade guild), and the phrase 'Honneur aux Arts' ('Honor the Arts'). It dates from the third quarter of the 19th century, probably 1871 and is privately owned. Rising three storeys above a basement its facade presents five regularly spaced bays including a main central section. The principle interest in the house resides in the central carpentry emerging from the attic roof and the front wall, creating a series of spires and skylights. 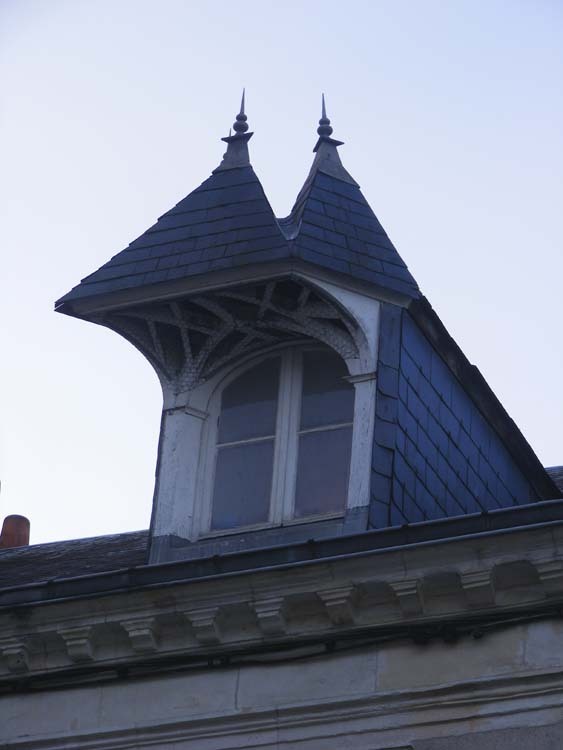 The complex design of this dormer is a style called a triple capucine, being a square tower covered with a pavillion roof on to which are attached separate attics of different forms. The roofs of the large attic, pyramids and polygons, are in straight set slates. Those of the small conical attics and the dome off the facade were treated more decoratively, but over the years various restorations have not always been true to these schemes. Graduated, arranged in bands, these slates can be straight, cut as scales or set on point. All these roofs had pointed finials. 72 rue de la gare, Chateauroux. This fabulous building turns out to be for sale, something I didn't know until I turned up to photograph it for the blog. I see from the pictures on the real estate agent's listing that not only is it special on the outside, it features one of the great gifts of the French to interior decoration -- wallpaper that goes up the wall and across the ceiling. 72 rue de la gare seen from a distance -- fabulously gormenghastly. While I was photographing the house a couple on their way to the station stopped so as not to photobomb me. As a result we struck up a conversation. They said they would never have noticed the amazing roofline if I hadn't been crouched on the pavement photographing it. They were well pleased to get a little serendipitous architectural treat. 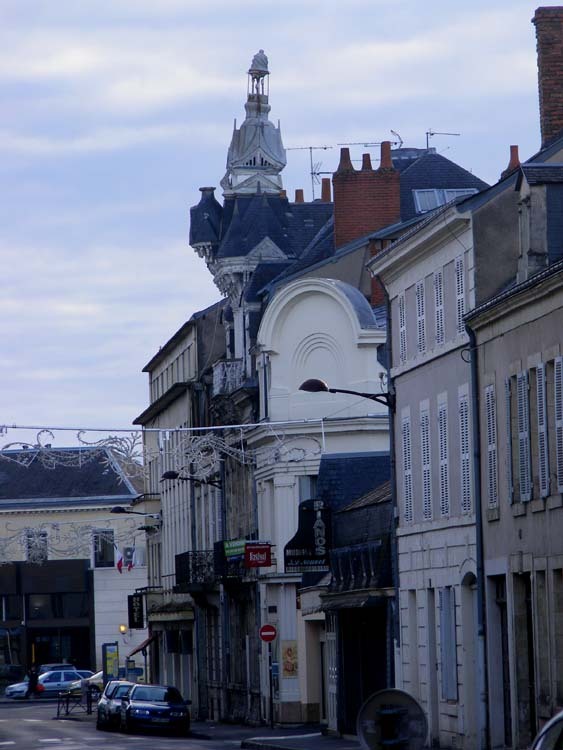 *Chateauroux is in the old province of Berry. For more about lucarnes, guitardes and capucines see my post Guitars in the Windows. Le temps hier: Hurrah! Snow! Well, 10 minutes of softly falling flocons anyway...There was a heavy frost so I had hopes that the snow would stick. It was our first snowfall for three years, but the sky cleared and the sun came out, so frost and snow melted very quickly. Loire Valley Nature: A new entry has been added for Trompette de la mort Craterellus cornucopioides, one of the most sought after edible mushrooms in the forest (despite its off-putting vernacular name). A new entry has been added for Wood Blewit Lepista nuda, a mushroom popular with chefs. A new entry has been added for the aptly named Upright Coral fungus Ramaria stricta. Why are Barn Doors Red?